I am excited to introduce a new pattern today! 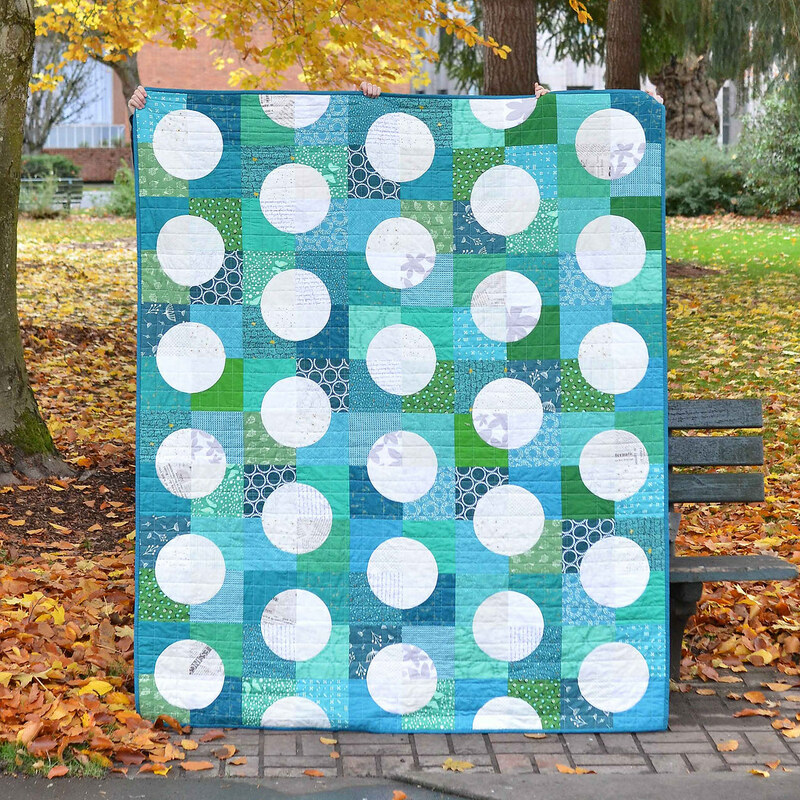 When I originally made this quilt for my daughter, I wasn't sure if people would be interested in a quilt that involves curves so I was on the fence about writing a pattern. But after a few requests, I decided to go for it. The pattern is now available on Craftsy and Etsy. In addition to having instructions to make the larger polka dots (like I did in my quilt), there are also instructions to make small polka dots! 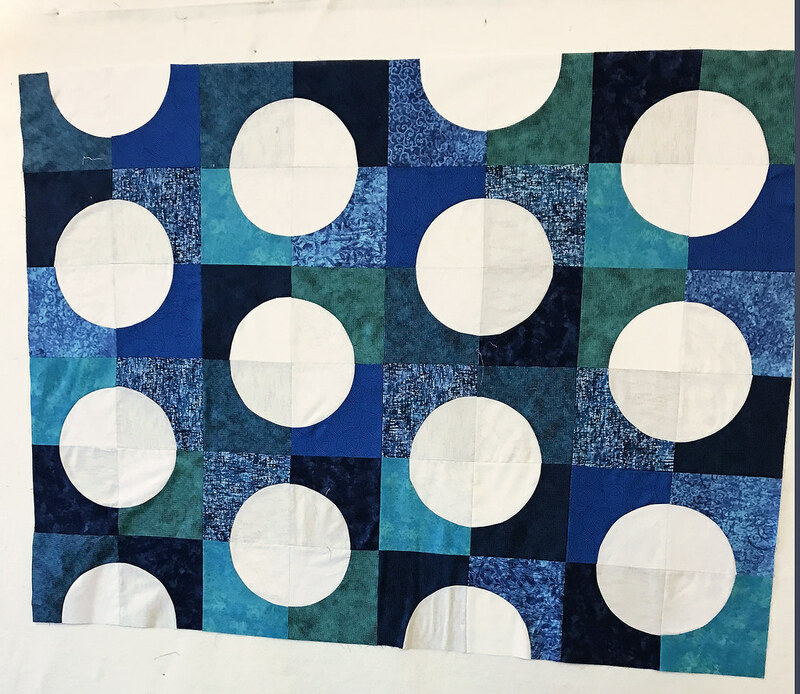 This pattern is a great introduction into sewing curves if you are trying them out for the first time - the curves are not too severe and once you are done sewing the curve, you are done with the block so the quilt is actually pretty quick! 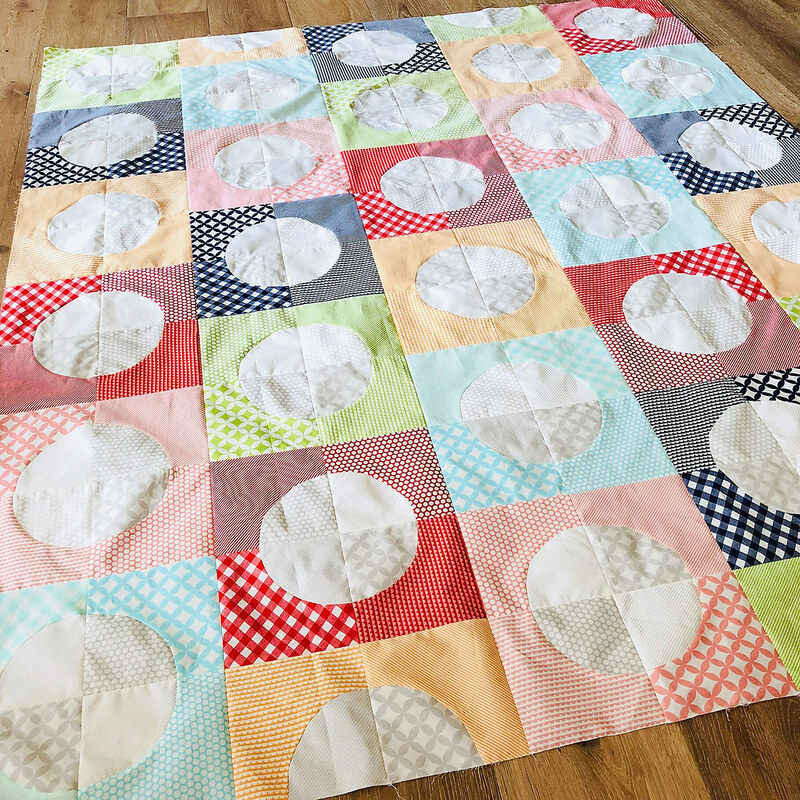 The pattern works well with scraps or yardage and the instructions allow you to choose however many different fabrics you want to use in your quilt. The PDF download includes coloring sheets to help you plan your quilt. I had 4 wonderful pattern testers for this pattern and I am so excited to show you what they made. One of my favorite things about writing patterns is seeing how people make the pattern their own. This is the SEVENTH quilt that Miranda has tested for me. She is amazing and always does an incredible job! 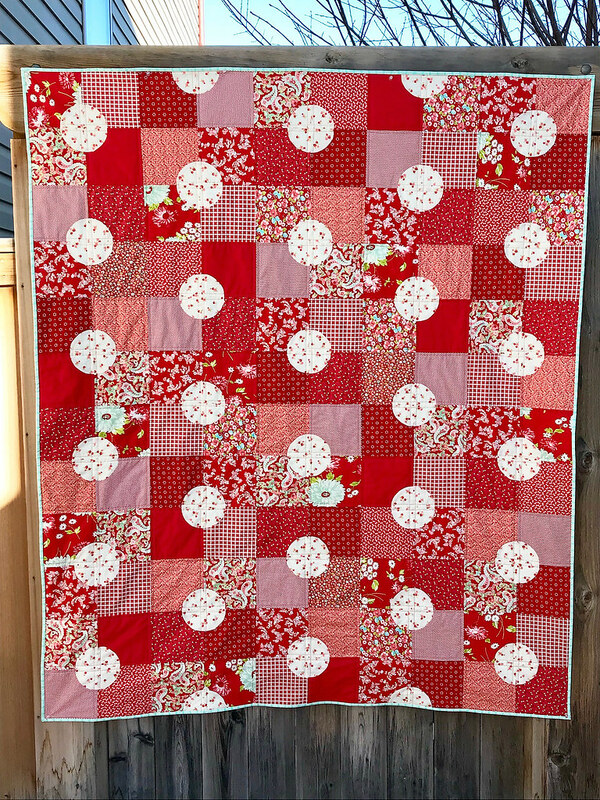 Her quilt uses Bonnie and Camille prints and the smaller polka dot size. I was so excited when I saw Michele's quilt because it never occurred to me to use different colors like this. 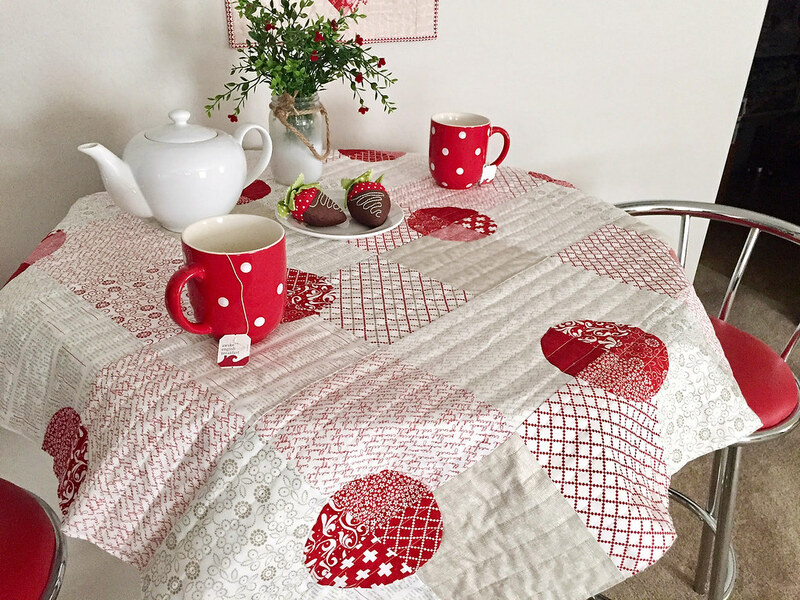 Her quilt uses the larger polka dots. This is what Michele had to say about the pattern: A great, clear pattern that I definitely plan on making again! It’s a pattern with the perfect amount of challenge! Enough to be fun and exciting but not so much to be considered tricky or difficult. I’d recommend it to anyone! Carol made the baby size version and is using it as a table topper - so cute! She made the smaller polka dot version and did red and white like Miranda, but with the colors reversed. It turned out great! Donna was invaluable in helping me with this pattern because she asked so many questions that hadn't even occurred to me and that helped me clarify the instructions. Thanks Donna! She used the larger polka dots and a beautiful color scheme. One interesting thing was that I gave each of the testers a choice of making the larger or smaller polka dots - I was curious what people would prefer. It looks like it was split 50/50! What are you waiting for? Click here to buy your own version of The Harper Quilt! Beautiful quilt and color-ways. I like the grey used in some of the circles. Gives it kind of a shadow. Nice. I notice that the space between the circles looks like an H. An "H" for Harper! So cute! Do you have a tutorial on the curved piecing? I like this fabric has become a beautiful red dots. This is another winner! I love the colors used for each quilt. These are one of my favorite blocks!